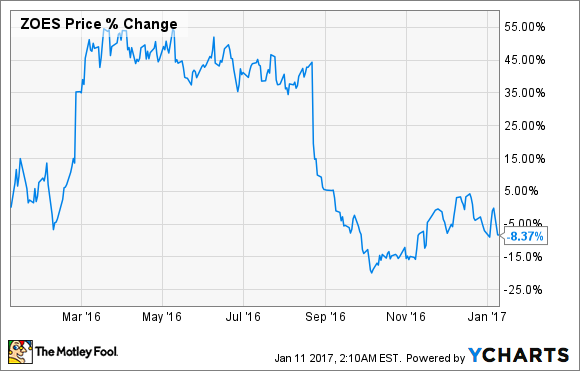 Is Zoe's Kitchen Stock a Good Buy for 2017? Owners of the fast-casual stock have endured a beating in recent months. With that beating, though, comes potentially good news as the business itself has kept growing. Poor Zoe's Kitchen (NYSE:ZOES) shareholders. Their bet on the fast-casual chain was seemingly starting to pay off, only to be upended last fall when the company reported worse-than-expected results. There is some silver lining to be considered, though, as the company grew its top and bottom lines over the past year. With that in mind, there's reason to think 2017 could hold better times for the stock. Let's take a closer look. An up-and-comer in the fast-casual segment popularized by Chipotle, Zoe's Kitchen specializes in fast, fresh Mediterranean-inspired cuisine. In spite of the conclusions you might draw from the stick-price chart above, the 200-location chain actually mustered up a pretty good year. In mid-November, Zoe's reported that total revenue had increased 23% in the 40 weeks ended Oct. 3, 2016, compared to the year-ago period. The company accomplished this through 36 new openings, but also benefited from comparable-restaurant sales increases of 4.9%. In addition, Zoe's Kitchen is in the black and is set to have its first full year of profitability. Net income during the 40 weeks rose to $2.3 million, up from a loss of $1.4 million during the same time the previous year, as company growth started to pay off. The company also added new menu items early in 2016, including two new flatbread sandwiches, that management says continue to be strong performers. An updated kids menu was rolled out in the third quarter, and the catering business that was started in 2015 has been a success in driving comparable-restaurant sales higher during the past year. All the positives got swamped, though, as management's upbeat tone for the fiscal year struck early in 2016 was tempered later in the year. The stock reversed course, but that isn't to say the company doesn't have big plans. 2016 was a landmark year for Zoe's, as total restaurant count passed 200 late in the year. That is an impressive feat, as at the end of 2013 the count was half that number. The chain now has its sights set on doubling store count again in just as short a time. Management sees the number hitting 400 by 2020, and thinks that 1,600 restaurants is in the cards for the longer term. But is that number realistic? It would seem so, as Zoe's brand of fast, fresh fare has grown to its current count in just 20 states, clustered mainly in the southern and eastern United States. Plus, the company has yet to break into the heavily populated food battleground states of California and New York. The company also feels it has unique positioning in the quick-service restaurant space with its offerings of Mediterranean-inspired plates. Management wants to leverage that position and reach diners outside of its restaurants as well. To that end, delivery service has been in test phase at 30 locations. Zoe's vision for the future includes a catering and small-delivery platform supported by an online ordering app, which is currently in development. Investors should listen in on reports during the next year for more updates on these initiatives. The positive news has not been enough to lift Zoe's Kitchen stock out of its doldrums, but the upstart diner keeps pushing business to new highs. Investor expectations got a little ahead of the curve over the last few years, so the late-year beatdown isn't totally unwarranted. However, share prices are now hovering just below levels seen nearly three years ago when Zoe's debuted as a publicly traded company. With business rapidly growing, the company now turning a profit, and big ambitions in the works, the recent drop looks like a gift to new investors looking to take a stake in the fast-casual chain.